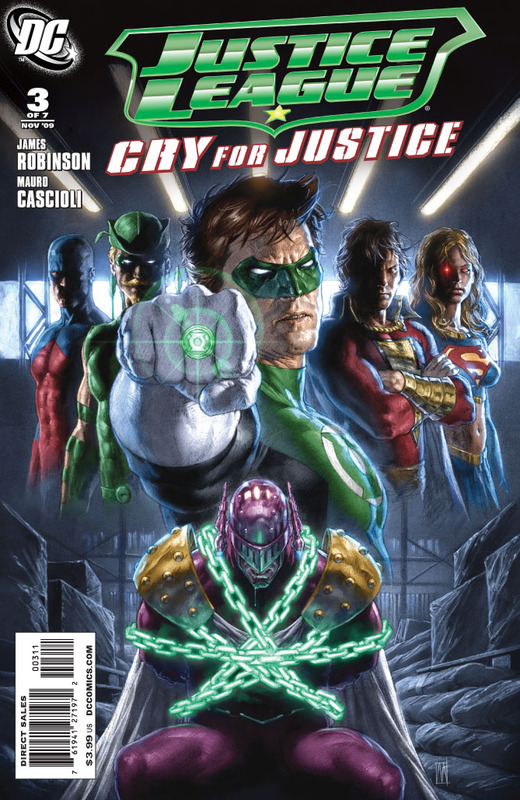 Justice League: Cry For Justice by writer James Robinson and painter Mauro Cascioli continues, with its third issue arriving this week. You can see a preview here. For the interest of discussion, I’ve posted the first few pages below. I’m sure you can guess which page has fanboys and frustrated fangirls talking. 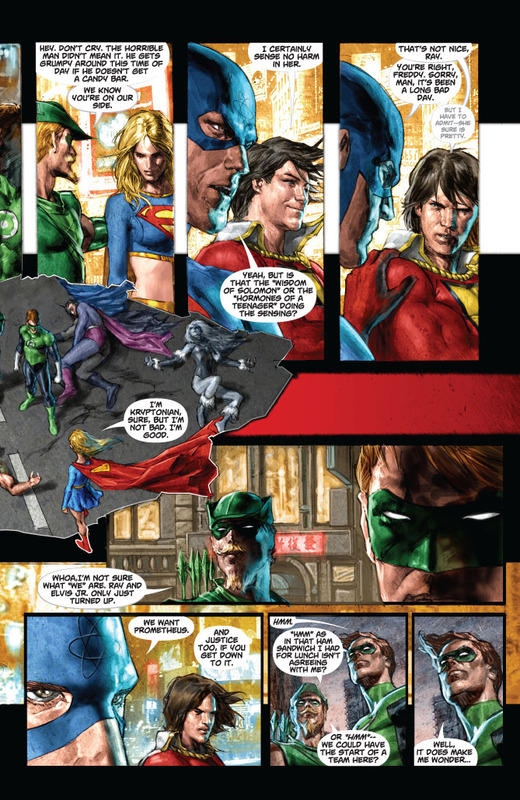 This page was first revealed a few months ago in the back of a few DC titles. I know DC cop a lot of flack for their treatment of female characters. The main sore points would be the stuffing of Green Lantern Kyle Rayner’s girlfriend into a refrigerator and the lack of a memorial in the Batcave for the assumed-dead Stephanie Brown Robin. However, since then DC have made some good strides I reckon. Brown is now back, as the new Batgirl. 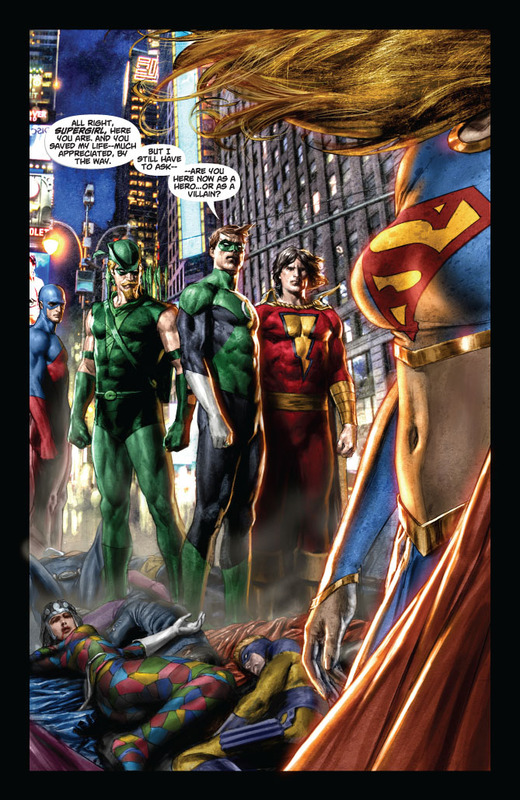 They’ve put more females such as Vixen, Dr. Light and Zatanna in the ranks of the Justice League, and have even given Supergirl briefs to conceal her modesty, as she does wear a short skirt and fly around a lot. It is a good composition and obeys the rule of thirds and all that, and if Superman were to replace Kara in the same position, no-one would bat an eyelid. 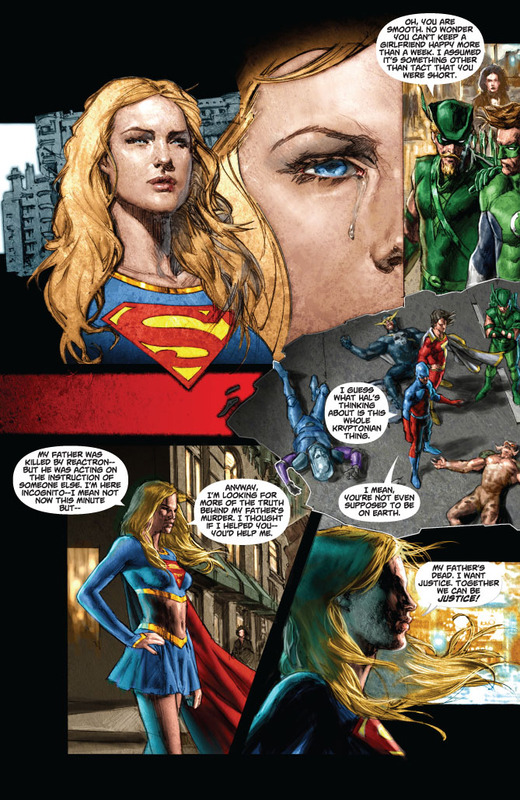 But by reading the dialogue, it becomes clear that both creators are using the scene to reinforce what the reader is thinking (ie, “That Supergirl sure is perty.”) and having the male characters agree. Perhaps it’s just a matter of page design supporting a certain mood in the story and in that way, it works.